Hello friends! 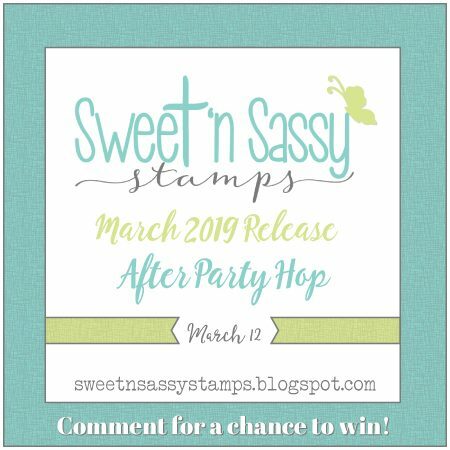 I’m glad you are joining us for the Sweet ‘n Sassy March 2019 Release After Party Blog Hop! 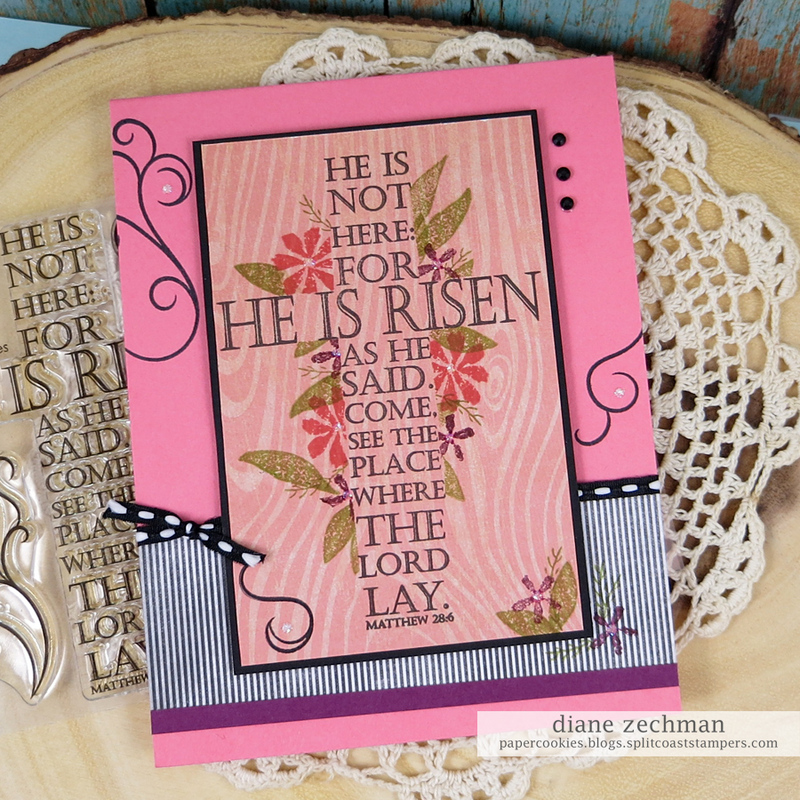 This month SNSS has released a wonderful collection of spring and Easter themed sets. We love them ALL and wanted to share a little papercrafting inspiration with you. Please be sure to visit all of the blogs below for some fabulous eye candy and then leave a comment at every stop along the way for a chance to win. 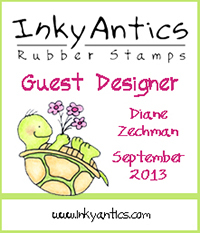 One reader will be randomly selected to receive a gift voucher to the Sweet ‘n Sassy Stamps shop! What’s not to love about free stamps??? We’ll announce the winner next week, so let’s get hopping. First I used some post-it notes to mask off the right side of the card front. I used a fine black marker to draw a line along the edge. Next I chose some coordinating colors of ink that I thought might work ok to stamp onto the kraft colored base. 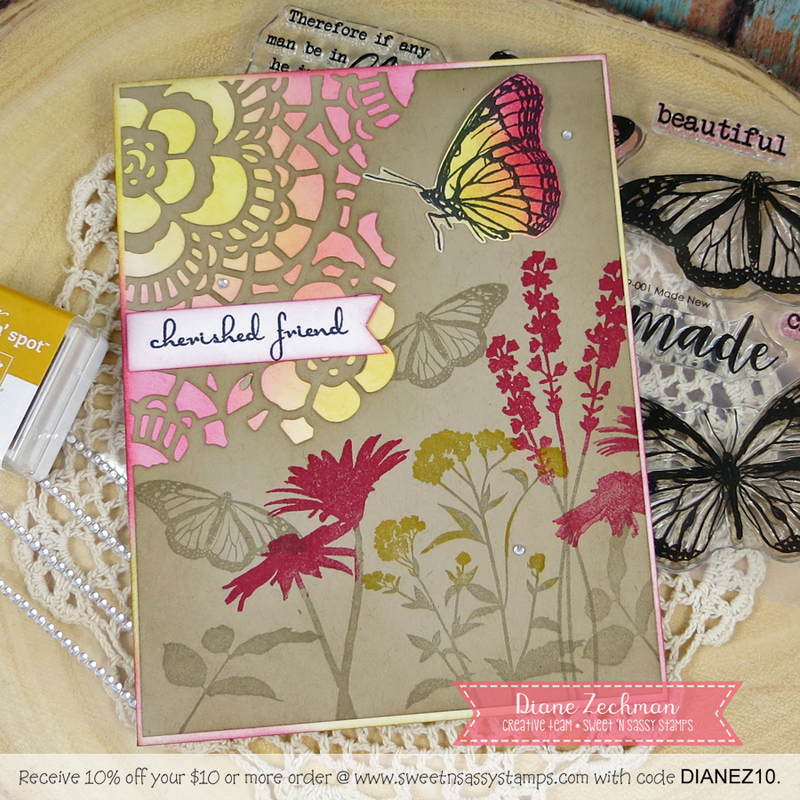 I used the awesome heart and flowers from the SNSS Genuine Love set from this month’s release and stamped them on the lower right corner. 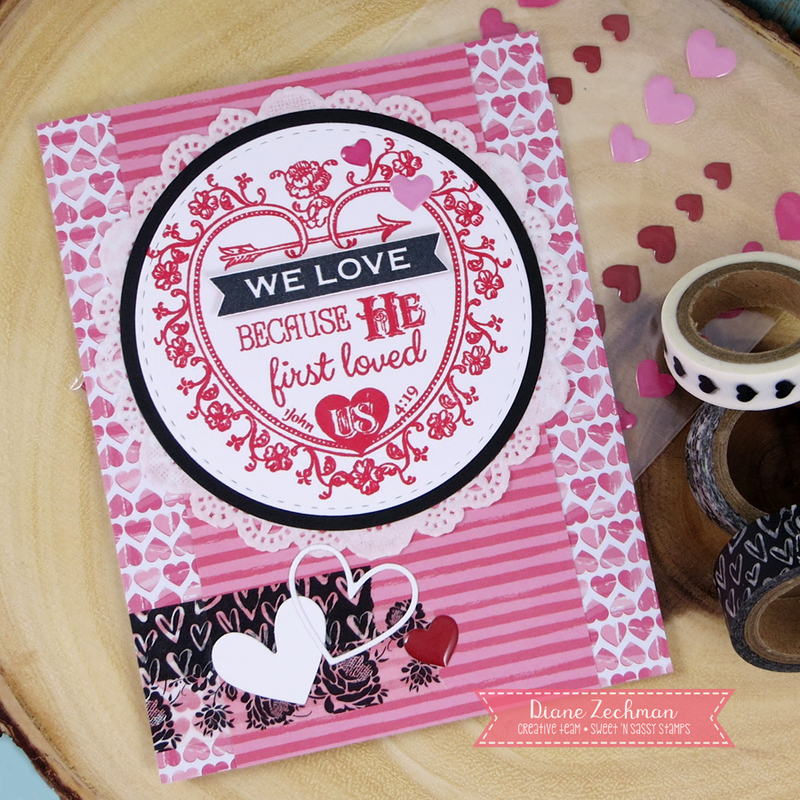 Then I added my saying with stamps from SNSS’s His Love set. I finished with a few enamel dots. 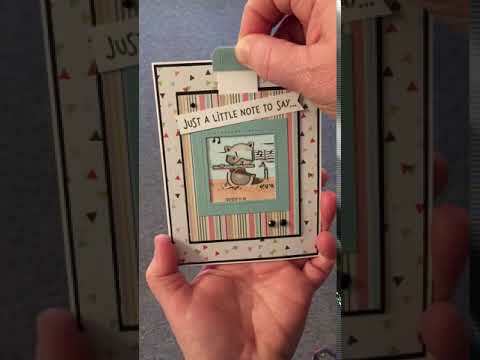 This is a very easy, soft-colored card and it would have a different, striking look if you simply switched it up with white cardstock and bold colors! Thanks for hopping with me! Have a great day! stamps- Sweet ‘n Sassy Genuine Love and His Love; paper- SU! Crumb Cake; ink- Memento Tuxedo Black, SU! Tip Top Taupe, Highland Heather, Wild Wasabi, Dapper Denim, Pool Party; accessories- enamel dots. Good morning! 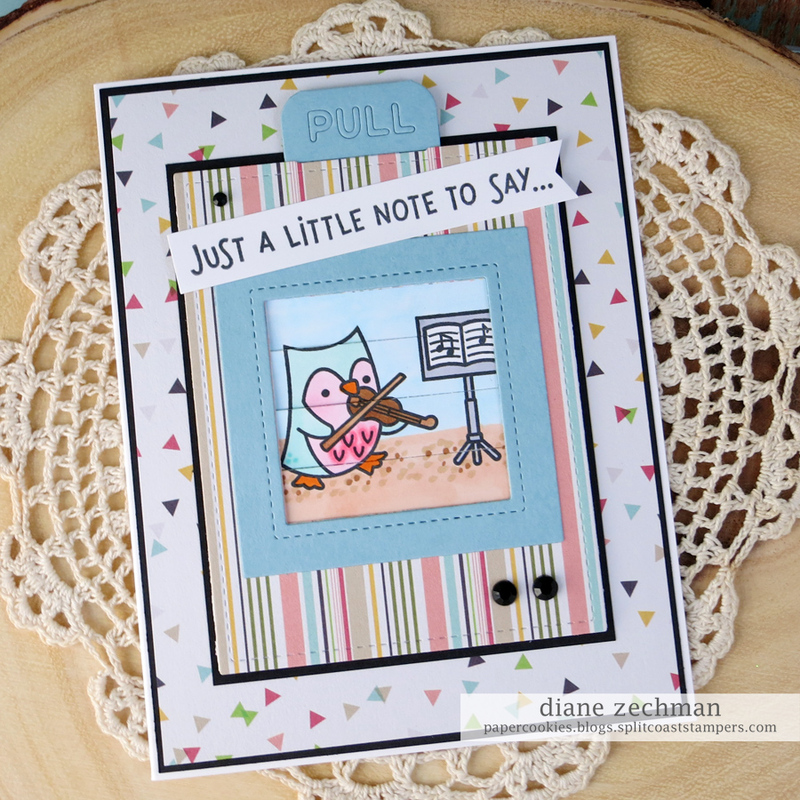 Today I have 2 cards to share with a super cute set from this month’s Sweet ‘n Sassy release. Here I used Genuine Love… a must have! On my first card I also used His Love and a butterfly from Made New (last month’s free set) which can now be purchased! To start, I cut a circle out of a post-it note and threw the circle away. I used the negative part to place around my stamped words as a guide. Then I stamped the wreath inside of my masked circle. I cut the blue flower from the heart image in His Love. I made another “wreath” around the words on my other card too. This time I started with the arrow image, bending it on the clear block to make it curved. stamps- Sweet ‘n Sassy Genuine Love, His Love, and Made New; paper- white, black, SU! Pretty in Pink, Pebbles- Garden Party; ink- Memento Tuxedo Black, various SU! inks; accessories- Copics, rhinestones. Good morning! 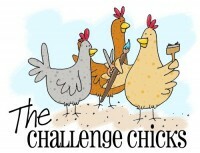 Today is the last day of February… (already!) 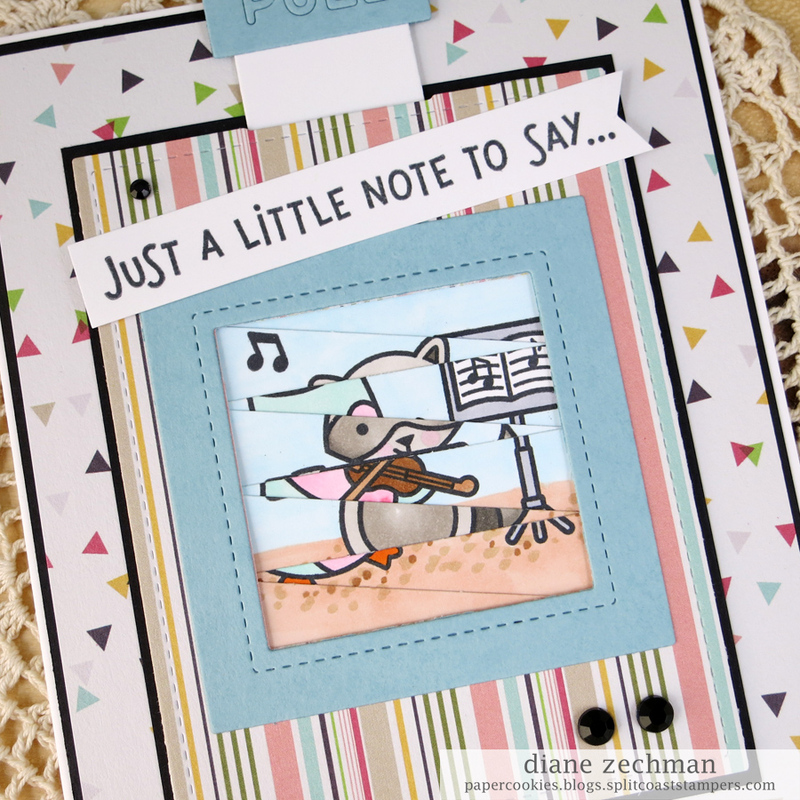 and I have 2 more cards to share from this month’s Sweet ‘n Sassy release. Here I used Girl Power 2, Typewriter Blocks Alpha, Made New and Forever & Always. All of the stamps this month coordinate so well and while I had them all out, I realized that I could try putting the butterfly wings on a girl from Girl Power 2. It worked perfectly lining them up with my MISTI! Next I paired the alpha with another hairstyle on the girl for a different type of card. Have you ordered this month’s release yet? Have fun combining sets and see what you come up with! Have a great day! stamps- Sweet ‘n Sassy Girl Power 2, Typewriter Blocks Alpha, Made New and Forever & Always. ; paper- white, SU! Crumb Cake, Melon Mambo, The Paper Studio- Harper’s Boutique, Making Memories- Chloe’s Closet; ink- Memento Tuxedo Black, SU! Melon Mambo, Early Espresso; accessories- Copics, MFT Blueprints 15, SU! Scalloped Border punch, rhinestones. Good morning! 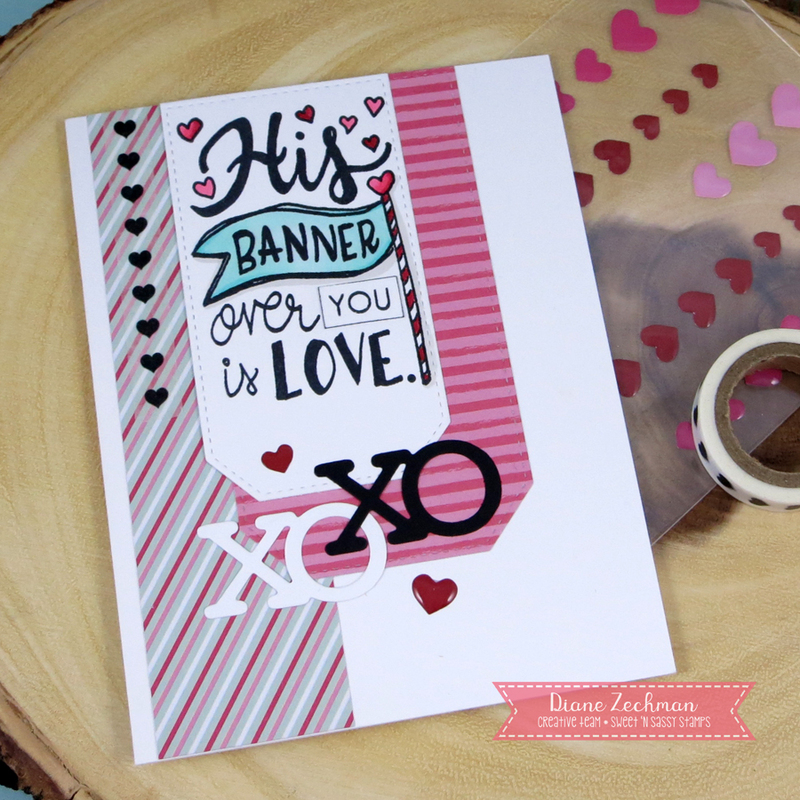 I have FOUR cards to share using the Sweet ‘n Sassy February Stamp of the Month: Made New. 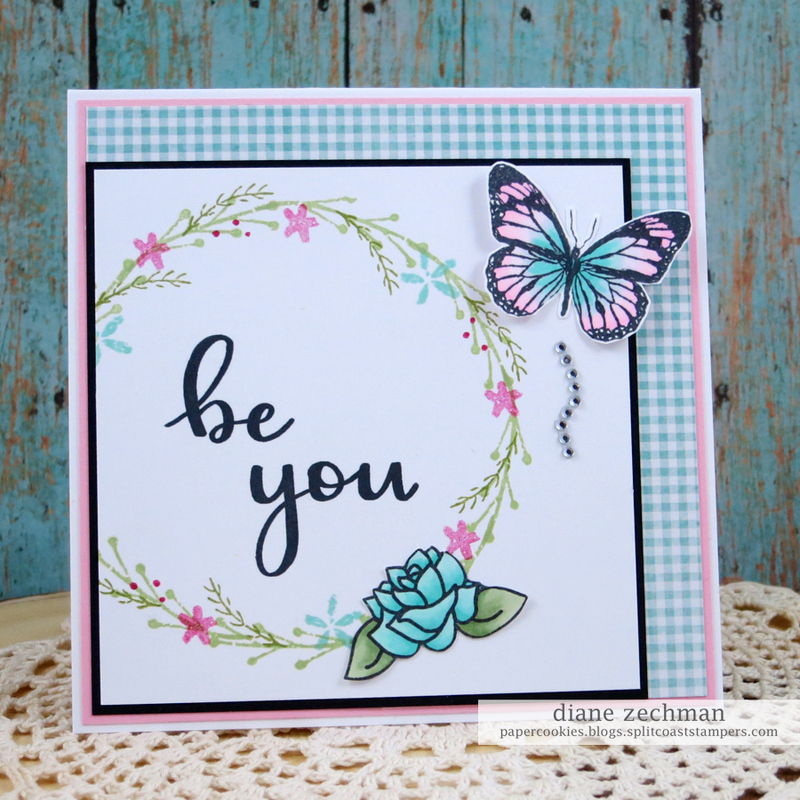 These butterflies are so pretty and very versatile. 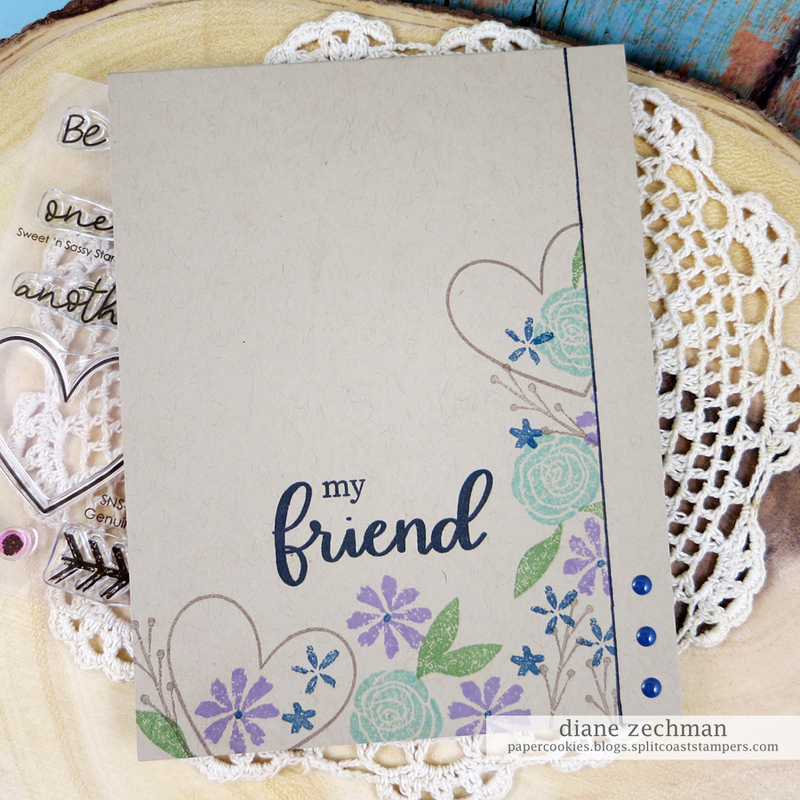 Last week I shared two other cards with them…they’re so fun to use! For my cards today I also used these SNSS stamp sets: Forever & Always, Typewriter Blocks Alpha, Nature Silhouettes, and Long Stem Silhouettes. I stamped them in lots of colors for my background on the first card, then the black one was popped up with dimensionals. For the third card I die cut the top corner and sponged some inks on the layer behind it. Flowers were stamped with the same colors and the butterfly was colored to match. stamps- Sweet ‘n Sassy Made New, Forever & Always, Typewriter Blocks Alpha, Nature Silhouettes, and Long Stem Silhouettes; paper- white, black, SU! Crumb Cake; ink- Memento Tuxedo Black, LOTS of SU! colors! ; accessories- Copics, Sizzix Tim Holtz Mixed Media #2 dies, SU! Vintage Wallpaper embossing folder, circle punches, rhinestones, foam dimensionals. Hello! 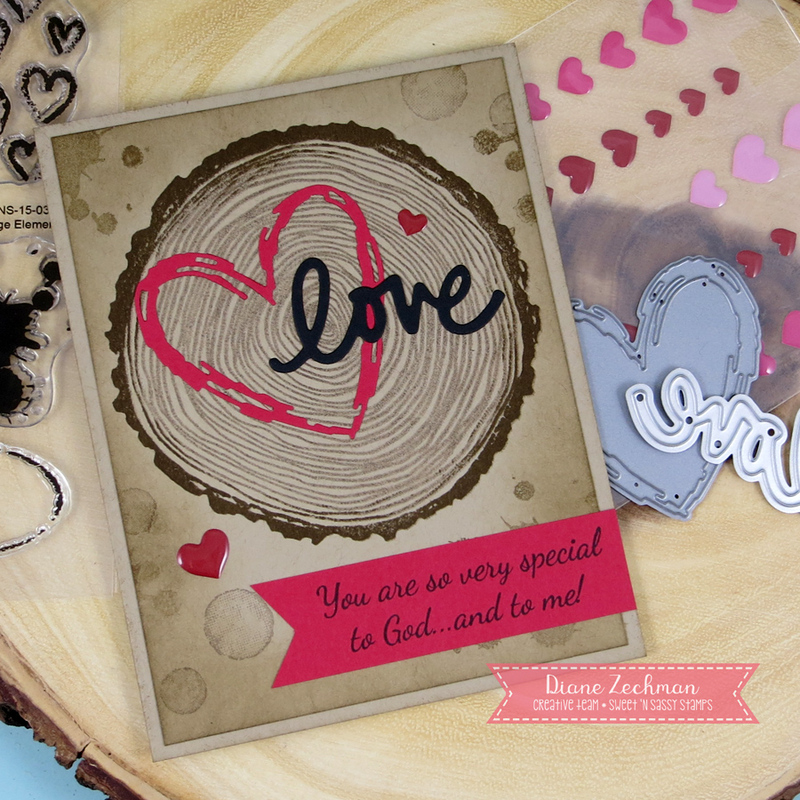 I have two CAS cards to share today using the Sweet ‘n Sassy February Stamp of the Month: Made New. I also used Happy Alpha and Scribble Flowers. This is a great butterfly set! 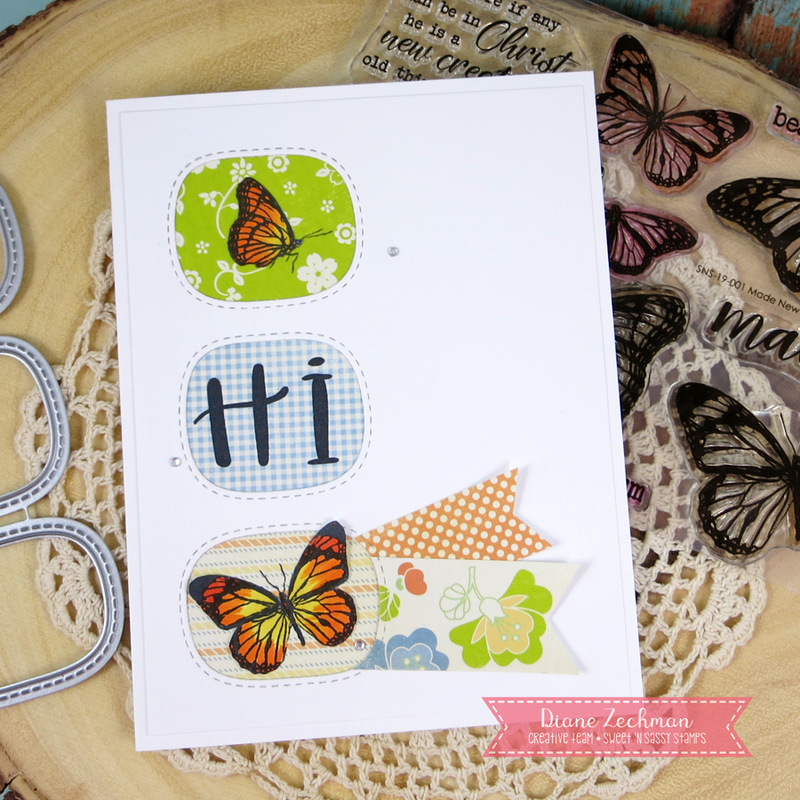 Now, here I diecut a triple window die in the front of my first card to showcase the butterflies and stamp a simple “hi”. On my second card I stamped “hello” with the alpha set. 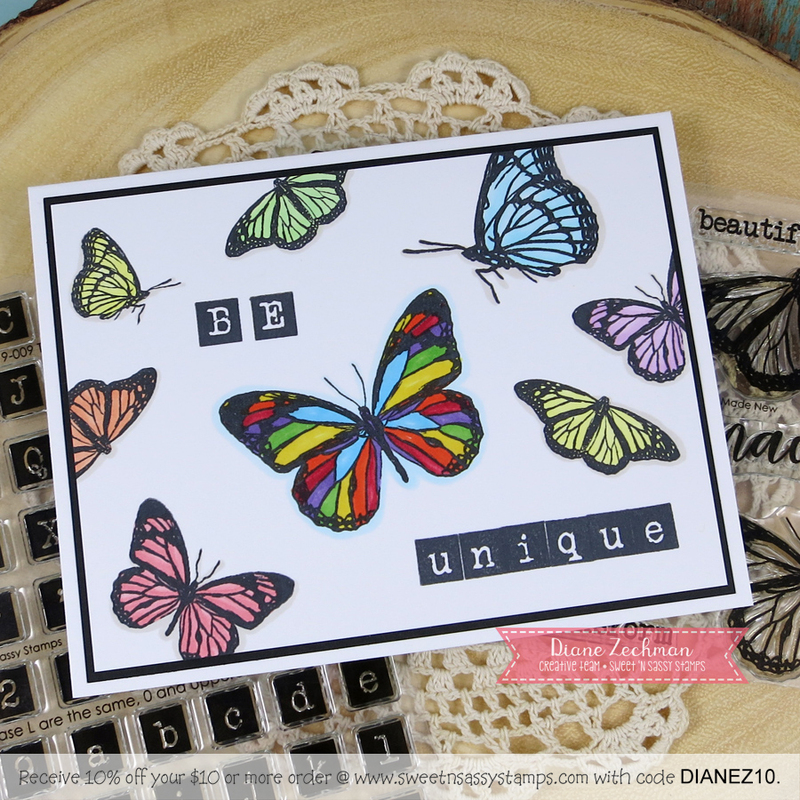 I kept the elements CAS by stamping the butterfly and flowers with black ink onto colored cardstock. 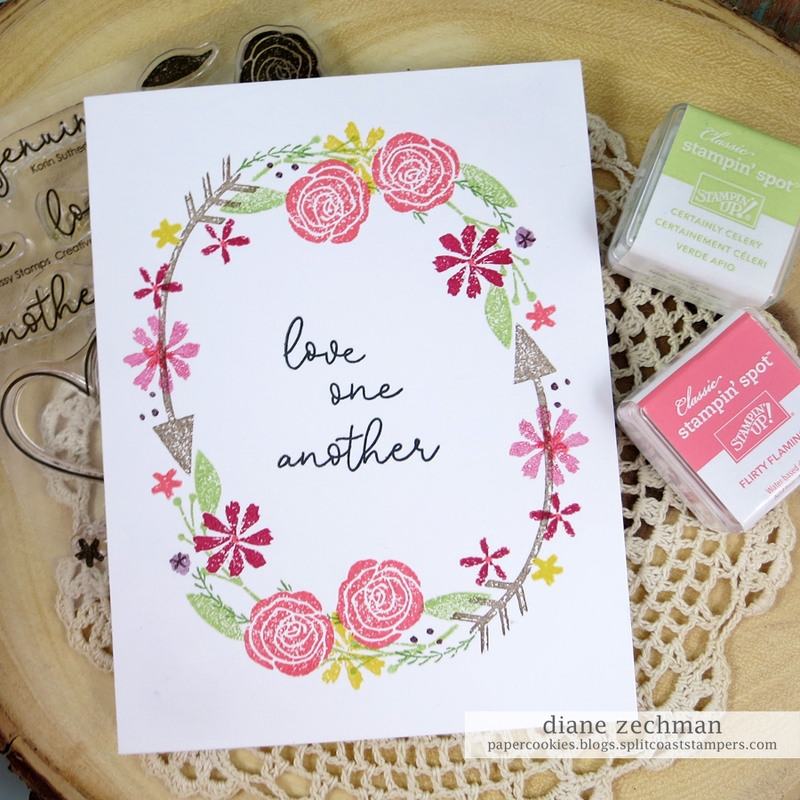 stamps- Sweet ‘n Sassy Made New, Happy Alpha and Scribble Flowers; paper- white, SU! Peach Parfait, Hello Honey, and Marina Mist, Making Memories- Chloe’s Closet; ink- Memento Tuxedo Black; accessories- Simon Says Stamp Scalloped Stitches, MFT Die-Namics Stitched Triple Peek-a-Boo Windows, rhinestones, foam dimensionals. Good morning! I think I have made more valentine cards this year than any other. But what’s not to love about valentine cards, right? 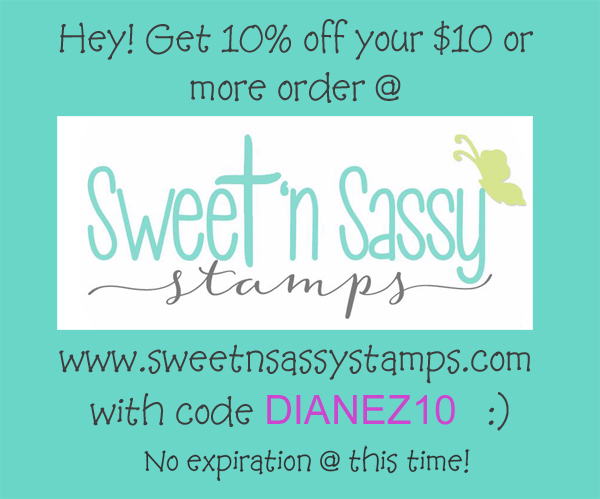 Today I have two more to share using some Sweet ‘n Sassy stamps. On my first card I used the new Forever & Always set. 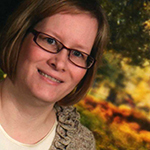 I also used How Tweet. I drew the little thought bubbles with a black pen and kept it a CAS card in black & white so the colored heart would pop. For the second card, I used the same Forever & Always set and also used Texture Tiles 1. The background hearts are more of a peachy-pink color. The flourish heart is so pretty! I popped it up with foam dots. 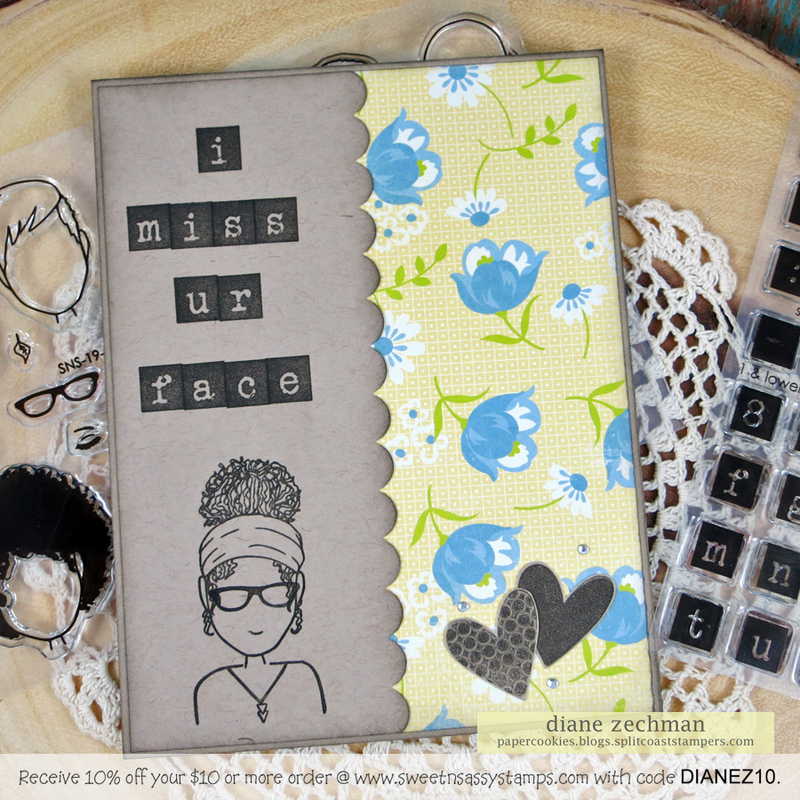 stamps- Sweet ‘n Sassy Forever & Always, How Tweet and Texture Tiles 1; paper- white, black, SU! Melon Mambo; ink- Memento Tuxedo Black, SU! Melon Mambo, Rich Razzleberry, Flirty Flamingo, Smoky Slate; accessories- foam dimensionals. The first one uses What A Savior. The second one uses a retired stamp, His Banner. 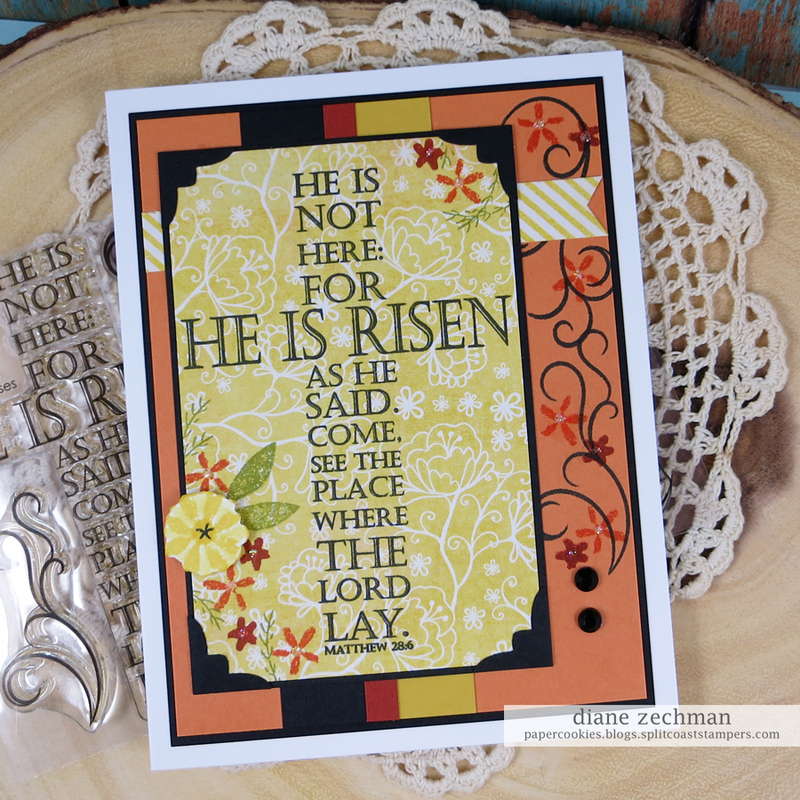 My last card used Wood Backgrounds, Scripture & Sentiment Companions, and Grunge Elements 2.
stamps- Sweet ‘n Sassy What A Savior, His Banner, Wood Backgrounds, Scripture & Sentiment Companions, and Grunge Elements 2; paper- white, black, red, SU! 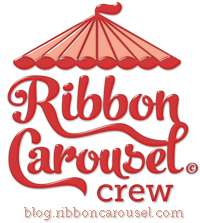 Crumb Cake, Recollections Girlsquad; ink- Memento Tuxedo Black, SU! Real Red, Tip Top Taupe, and Soft Suede; accessories- Copics, MFT Stitched Traditional Tags, Simon Says Stamp Stitched Circles, Small Heart Doily, XOXO Border and Sketch Heart dies, Circle Nestabilities, paper doily, foam dimensionals, heart stickers, washi tape, Recollections love die. Good morning! In November Sweet ‘n Sassy released a stamp set with a combination of several previous snowman images called Crazy About Snowmen. Today I have two CAS cards using this fun set and I also used the cute Heart Candy stamp set. There are a few pretty snowflakes in this set too! Maybe you can’t buy the heart candy to eat this year but you sure can stamp them! 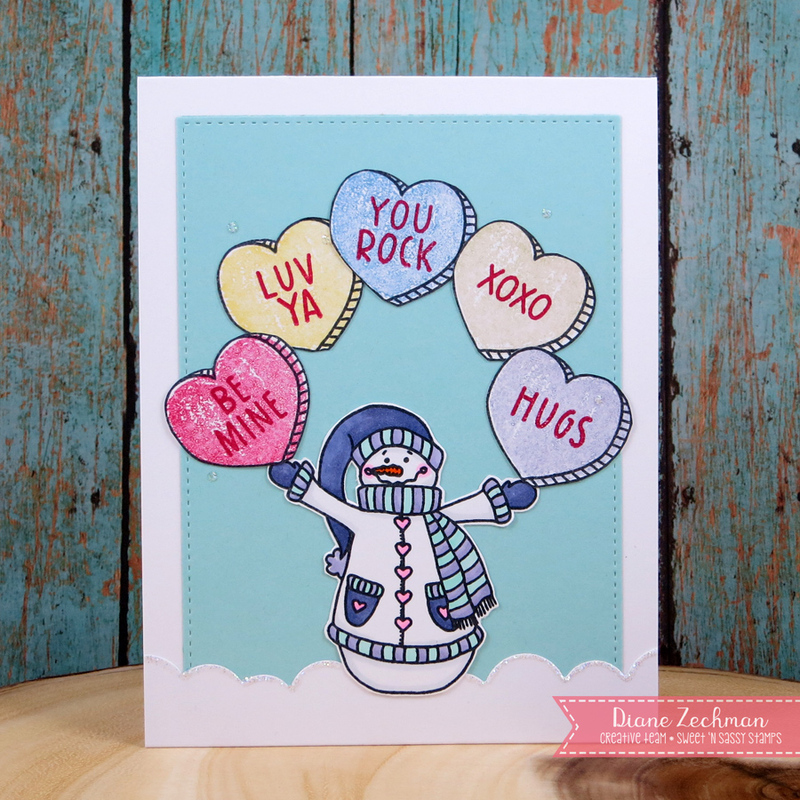 stamps- Sweet ‘n Sassy Heart Candy, Crazy About Snowmen; paper- white, SU! Pool Party; ink- Memento Tuxedo Black; accessories- Copics, MFT Blueprints 20 and Wonky Scallop Border, Stickles.